People hold banners during a sit-in in solidarity with the people of Aleppo in Idlib, Syria, May 4, 2016. The banner reads: "Oh, Aleppo, your victory is promised no matter how many crowds they bring to you." The United States and Russia have brokered a localized cease-fire in the Syrian city of Aleppo, where fierce fighting between the government and rebels has resulted in over 280 civilian deaths since late April. The State Department said the reaffirmation of a cessation of hostilities in Aleppo and surrounding areas took effect at 12:01 a.m. Wednesday local time. The Syrian regime said that it would respect implementation of the cease-fire in Aleppo but that the truce was only for 48 hours. 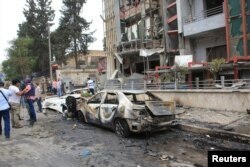 In a statement, the Syrian opposition called for a cessation of hostilities in all areas, not just select locations. "The cease-fire must, without exception, cover all of Syria, including Aleppo. Otherwise, it will not succeed," said spokesman Salem al-Meslet. Journalists and civilians stand near the damage after rockets fired by insurgents hit the al-Dabit maternity clinic in government-held parts of Aleppo city, Syria, in this handout picture provided by SANA, May 3, 2016. U.S. officials said that while there had been reports of fighting in Aleppo since the cease-fire took effect, overall violence was down. The United States and Russia are co-chairs of a cease-fire task force that has been working to salvage a nationwide cessation of hostilities in Syria that took effect in February. World powers are concerned that the recent escalation in fighting and the lack of significant progress in political talks between the government and opposition could hamper the multinational effort to fight Islamic State in Syria. The new localized cessation for Aleppo is similar to cease-fire agreements announced by the United States and Russia last week for the coastal province of Latakia and the Damascus suburb of Eastern Ghouta. State Department spokesman Mark Toner said that under the plan for Aleppo, Russia would use its influence with Syrian President Bashar al-Assad’s regime and the United States would use its leverage with the opposition to try to keep the agreement in place. U.S. officials said the overall goal of establishing a nationwide cessation of hostilities remained. “We will continue to work to de-escalate the violence all across Syria in hopes of being able to move back to the [political] talks as soon as people have confidence that this is really taking hold,” Secretary of State John Kerry said. However, he declined to say what other areas U.S. and Russian officials were considering. In New York, meanwhile, Britain and France requested an urgent meeting of the U.N. Security Council to discuss the situation in Aleppo. “At this very hour, the fragile agreement between the Russians and Americans that just entered into force is an encouraging sign, but it needs to be translated into facts on the ground,” French Ambassador Francois Delattre told the council. He said much more must be done to ensure the cessation of hostilities is respected. Otherwise, Syria will “return to the horror and the resumption of clashes,” he said. 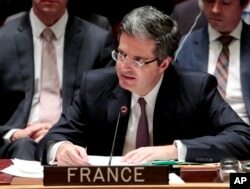 Delattre said France had called for a ministerial-level meeting on Monday in Paris with the Friends of Syria group, with the aim of ending the violence and restarting political negotiations. The Friends of Syria is an international collective of countries and bodies that has convened to discuss Syria outside the Security Council. Several council members blamed the Assad regime for the deterioration of the truce in Aleppo. Russian envoy Vitaly Churkin said Damascus was waging a large-scale offensive against jihadists. He also questioned the political will of countries with influence over the moderate opposition, saying they did not appear to be pressing them to break links with groups like the al-Nusra Front and to participate in the Geneva talks. U.N. political chief Jeffrey Feltman warned parties not to waste the opportunity of U.N.-led political talks in Geneva. “Allowing the parties to the conflict to play for time or territory on the ground to strengthen their position at the negotiating table would be a mistake,” he said. Feltman said the U.N. hoped to get another round of intra-Syrian talks underway this month. VOA U.N. correspondent Margaret Besheer contributed to this report.